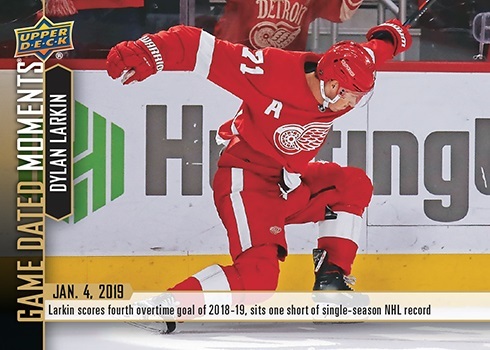 2018-19 Game Dated Moments Week 14 Cards are Now Available on Upper Deck e-Pack™! To unlock and purchase these packs, simply add any available hockey trading card product on e-Pack to your cart. 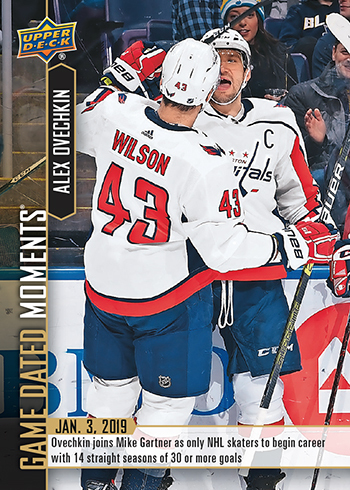 * This week’s pack of 2018-19 Game Dated Moments cards will be available for purchase in the Upper Deck e-Pack™ Store until 1/18/2019 at 8:59 am (PST). 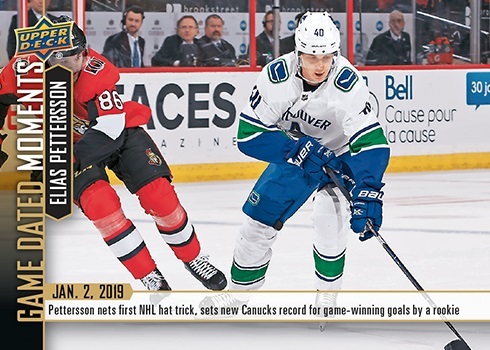 After winning Rookie of the Month honors for the month of December, Canucks breakout rookie Elias Pettersson becomes only the 7th rookie with a hat trick that includes an OT goal and breaks the Canucks rookie record for game winning goals with his 6th versus the Senators in a memorable night for the young Phenom. Ovechkin joins former Capitals legend Mike Gartner as 1 of only 2 players to ever start their career with 14 consecutive seasons of 30 or more goals and continues to pace fellow scorers around the league as he becomes the fastest to the mark for the 5th time in his career. The Red Wings surrender a late game goal to the Preds to send it to OT but Detroit’s young star, Dylan Larkin, pulls the team out of a possible Motor City meltdown as he scores his 4th OT goal of the season. The win ends a 6 game skid and breaks a franchise record for OT goals as he moves within 2 of breaking the league record for such goals. 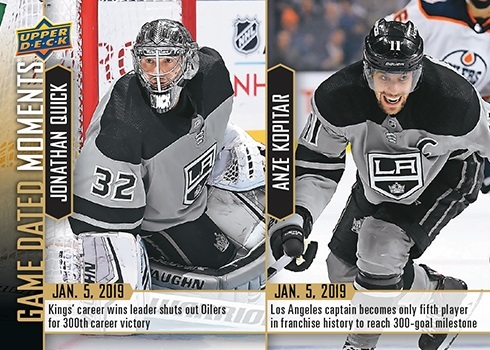 In an impressive 4-0 shutout of the visiting Edmonton Oilers, Anze Kopitar notches his 300th career goal while fellow teammate, and fellow 2x Stanley Cup Champion, Jonathan Quick records his 300th win and becomes the 2nd fastest American born goalie to reach the milestone. Stay up to date by following the Upper Deck e-Pack™ NEWS page for future announcements regarding Game Dated Moments! It’s not too late to grab retired Game Dated Moments that you may have missed! 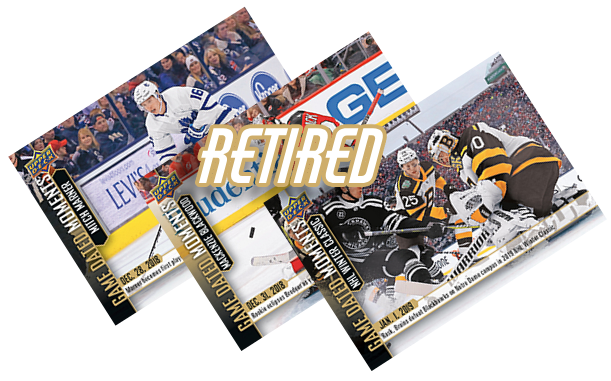 Head on over to the e-Pack Trading Marketplace and spark up a trade for these retired 2018-19 Game Dated Moments cards to complete your collection! *Packs will expire from the store the following Friday at 8:59 am (PST). **To purchase Game Dated Moments packs in the e-Pack store, you must purchase at least one other (non-Game Dated Moments) Hockey trading card product in the same transaction on e-Pack. Adding a hockey trading card product to your cart will unlock the Game Dated Moments product and allow you to add up to 99 of every available unique Game Dated Moments packs to your cart. There is no limit on the number of Game Dated Moments packs you can purchase, but only 99 of each pack may be purchased in a single transaction. Game Dated Moments cards may be shipped or transferred to a linked COMC account. However, this option will not be enabled until 3-4 weeks after the corresponding packs are expired from the e-Pack store. If you have a Game Dated Moments card in your collection on e-Pack when the option to be shipped has been enabled, you will receive an e-mail from e-Pack alerting you. ©2019 The Upper Deck Company. 5830 El Camino Real, Carlsbad, CA 92008. All Rights Reserved.